SkyTeam, the global airline alliance, today welcomed China’s Xiamen Airlines as its 19th member. Xiamen Airlines is also the fourth member from Greater China. The airline strengthens SkyTeam’s footprint in China and its overall #1 position in the Greater China Region by adding three new hubs - Xiamen, Fuzhou and Hangzhou – combined with a comprehensive domestic and growing international network. SkyTeam, the global airline alliance, today welcomes Aerolíneas Argentinas as its 18th member. The national airline of Argentina – South America’s second largest economy - Aerolíneas Argentinas becomes SkyTeam’s first South American member, adding 40 new destinations to the SkyTeam network. SkyTeam, the global airline alliance, today welcomed Middle East Airlines – Air Liban (MEA) as its 17th member. The flag carrier of Lebanon, MEA becomes SkyTeam’s second Middle Eastern member, offering customers from the region access to an extensive global network. SkyTeam, the global airline alliance, announced several priority initiatives to enrich the customer proposition, strengthen the global network and achieve synergies. At their semi-annual meeting held in Beijing on June 10th, the chief executives of the SkyTeam member airlines endorsed the acceleration of multiple projects, aimed to improve the transfer processes between members. SkyTeam, the global airline alliance and members China Southern and China Eastern today signed a Cooperation Agreement with Beijing Capital International Airport that paves the way for more customer-focused initiatives to be introduced at the airport. SkyTeam, the global airline alliance, and member China Eastern today signed a Memorandum of Cooperation with Shanghai Pudong International Airport (SIA) to develop a number of key customer-focused initiatives at the airport. SkyTeam, the global airline alliance, today welcomed Saudia as its 16th member at a joining ceremony held in Jeddah. The flag carrier of Saudi Arabia, Saudia becomes SkyTeam’s first member airline from the Middle East and gives the alliance a strong foothold in this important economic region. 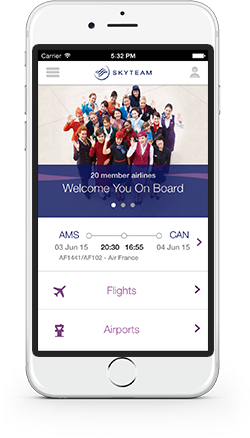 SkyTeam, the global airline alliance, has upgraded its online Round the World Planner to offer a number of new features designed to make booking a SkyTeam round the world itinerary even easier. SkyTeam, the global airline alliance, has launched a fully refreshed version of Skyteam.biz, its dedicated website for the travel industry. The site has been upgraded to have a similar look and feel to SkyTeam.com, but is packed with information and tools designed with the travel professional in mind. SkyTeam, the global airline alliance, has launched its new Go Africa Pass providing cost savings and flexibility on flights operated by Kenya Airways within Africa. The pass is available to business and leisure travelers flying with any of SkyTeam’s 15 member airlines on an intercontinental round-trip to Africa or a Go Round the World ticket. SkyTeam, the global airline alliance, and member China Southern Airlines today signed a memorandum of understanding (MOU) with Guangzhou Baiyun International Airport (GBIA) to implement a number of customer-focused initiatives. The MOU paves the way to developing the airport as a world-class SkyTeam hub and is the first agreement of its kind signed by the alliance in the Greater China Region. SkyTeam, the global airline alliance, today announced the introduction of SkyPriority, a series of distinctively branded priority airport services offered to Elite Plus, First and Business Class customers. SkyPriority has been developed to ensure a common and consistent service standard for priority airport services across the alliance. The roll-out of the program will start in March 2012 at selected hubs. SkyPriority will gradually be implemented at 800+ stations in the course of the next few months, reaching over 1,000 airports by early 2013.